Spinach (Spinacia oleracea) is known as one of the most useful green veggies packed with essential nutrients and natural elements. It originates from the Middle East: namely, from the warm lands of Persia, and in the Middle Ages spinach became very popular in France, Spain and other countries of Southern Europe. Nowadays it is being widely cultivated throughout the world. Spinach is recommended by modern nutritionists as the best source of iron, vitamins, minerals and mineral salts. 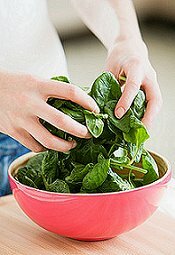 Spinach is a very low calorie plant and 100 g of it has only 17 calories. This herb is rich in minerals like magnesium, sodium, potassium, phosphorus, calcium, copper, iodine, zinc, manganese and, certainly, iron; it has folic acid and vitamins A, E, K, C and B complex; it is very rich in amino acids and fiber, and also has lipides, mineral salts and other essential elements. Spinach benefits embrace its diuretic, soothing, calming, coagulant, demulcent, detoxifying, laxative, cooling and other properties. This leafy vegetable can be used for preparing a variety of meals, as well as for preparing tinctures, infusions or very therapeutic spinach juice. There are numerous health benefits of spinach. As an excellent natural source of iron, spinach and spinach juice can be used to treat anemia and improve blood quality, strengthen heart muscle and lower the risks of heart attack. Spinach can be used as natural diuretic to treat urinary disorders like cystitis and others. Mixed with other herbs and herbal remedies, this medicinal plant can be used to treat respiratory problems like coughs, bronchitis, asthma and so on. One of the most important spinach benefits takes source from a high content of calcium in this plant. Spinach juice can be used to strengthen bones, prevent osteoporosis and help in improving dental health. Spinach can assist in strengthening the immune system. A spinach based diet is strictly linked to higher consumption of fiber which helps to prevent colon cancer and improve the digestive system. Rich in beta-carotene, spinach can effectively treat and prevent many of sight problems: in particular, substantially lowers the risks of cataracts. Iodine in spinach can help to normalize the function of our thyroid glad and assist in treating minor skin problems. Spinach juice is considered to be among the best known natural remedies for constipation. Health benefits of spinach embrace preventing diabetes due to a high content of magnesium. Spinach can be used as an ingredient of many remedies to calm down nervous system and induce sleep. This herb can be used to stimulate detoxification and get rid of various parasites. Spinach juice can be used to calm down headaches and migraines, as well as for normalizing blood pressure. Low in calorie, spinach can facilitate weight loss efforts and assist in cholesterol lowering. really this herb is more effective for health.